I have never considered myself a green tea drinker. But I’m obsessed with the benefits of matcha powder in my new face mask recipe. The anti aging benefits are pretty impressive. That’s thanks to the antioxidant packed matcha. Infused with 2 of my favorite clays, this face mask is gentle but effective on acne, blemishes, complexion and fine lines. I created 2 versions of this mask, one simple and one that is packed with a lot of my favorite ingredients. I recently read a EWG study, that indicated the average woman comes in contact with 12 products that go on her skin per day. Those 12 products will expose her to a cocktail of up to 168 chemicals. Even though most of those chemicals are “deemed safe in small amounts”, that’s a lot of chemicals to be continually putting our our skin. Our skin is the largest organ after all. That’s why I love clay so much. It’s an all natural product that finally brought me salvation from years after year battle with acne and scarring. So now I’m a little clay obsessed, to say the least. That’s why I launched our facial clay assortment pack. So that it can be easier to buy and try the different types of clay to see which ones you like best. I love them all! 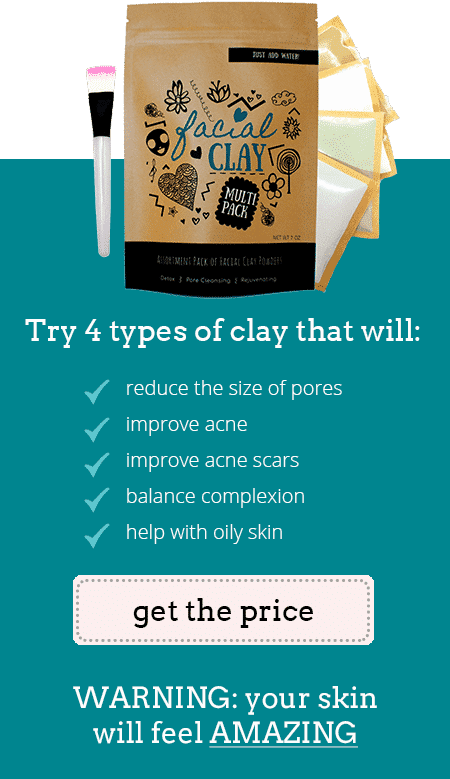 My 4 favorite types of clay we include are Bentonite, Kaolin, Rhassoul and French Green Clay. There is so much information the cosmetic industry doesn’t want you to know about all those can’t pronounce ingredients. If food is where we get our vitamins and minerals from to power our body, think about how much better that will do on your skin. For this mask, we didn’t just choose “any” food, matcha is a pretty awesome superfood. 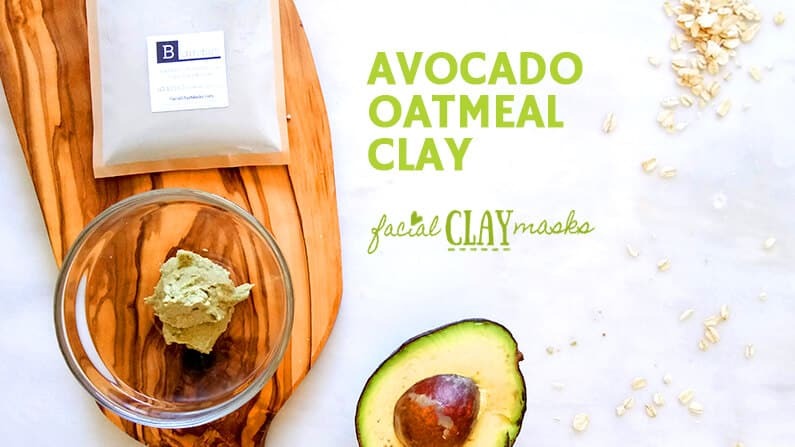 This matcha clay mask recipe uses a mix of Bentonite and Kaolin clay. Click here to buy our assortment pack on amazon. 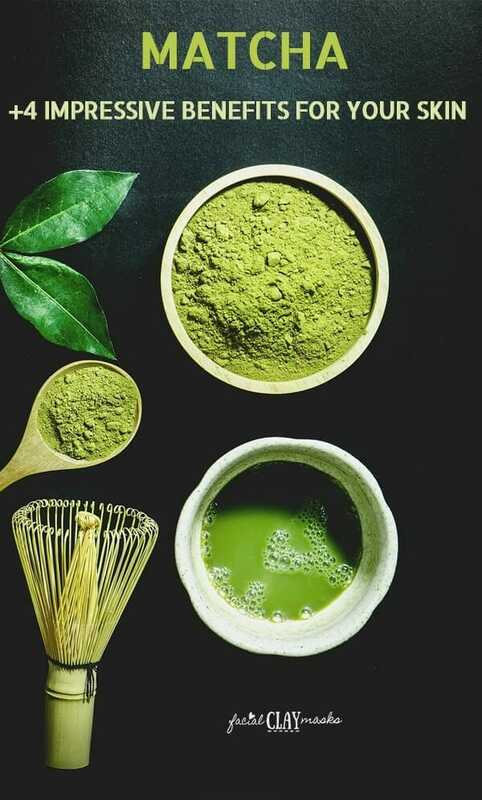 What are the benefits of matcha for your skin? What are the benefits of Lemongrass for your skin? What are the types of clay used in this recipe? What are the Matcha Clay Mask ingredients? 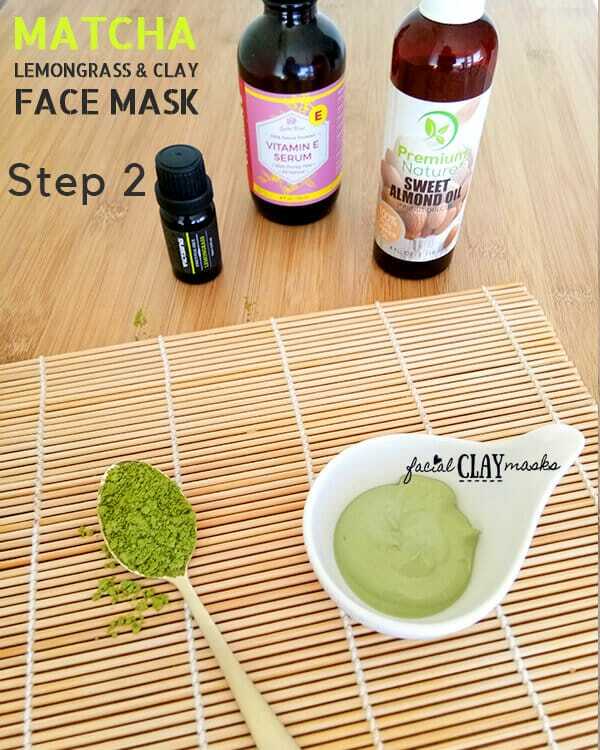 How to mix and apply matcha clay face mask. Matcha is a fancy word for concentrated green tea. I’m sure you know about how much better green tea is than coffee for you, while still getting caffeine. Green tea is often touted as one of the healthiest beverages on the planet. Matcha is made from ground tea leaves which are finely milled, dried and ground into a fine powder. That’s why you can scoop it out vs use the leaves from the tea bag. According to studies, one cup of matcha tea contains 10 times the nutritional content of green tea. The nutritional content is packed with fiber, amino acids, minerals, vitamin A, and antioxidants. You get 100% of the nutrients from Matcha. Contains more caffeine than coffee does per serving. But doesn’t give you the coffee jitters because of L-theanine. Chlorophyll in the Matcha can get rid of bad breath. Fiber from Matcha can help prevent blood sugar spikes. Slows down aging because of the high antioxidant content. Take that wrinkles. What does Matcha do for your skin? I have one word for you, anti aging. Hands down the best benefit of any product that is packed with antioxidants. I’m 29, my mother agrees with me now (sadly) that I should care about anti aging products, but I so wish I had started years ago. Adding nutrient packed vitamins and minerals to my skincare would not have been a bad thing at 20 vs the chemical filled products I resorted to for my acne. Green tea contains an antioxidant contained catechin, specifically EGCG (epigallocatechin gallate). The only major source that you can find this antioxidant. A study found that, Matcha contains 137% more antioxidants per serving compared to a brand of China Green Tips Tea. But more likely matcha contains 3 times more EGCG’s than a regular brand of green tea. Green tea benefits have not been studied directly, but rather indirectly by studying populations that drink increased amounts of green tea. There is even less research on matcha, but given that the concentrations are much higher it is expected to produce the same benefits. – Matcha green tea is anti-inflammatory. Goodbye redness from acne and – blemishes, hello even and balanced skin tone. – Powerhouse antioxidant EGCG’s are thought to be responsible for soothing the skin tone and reducing redness. They might also be useful in improving skin elasticity. – Anti aging. Antioxidants are powerful in the fight to protect your skin from free radicals. Antioxidants can help neutralize your skin molecules, preventing the free radicals from potentially causing signs of aging. – Improved appearance of sun damaged skin by the polyphenols contained in matcha. What type of matcha to buy? First of all, always buy organic, especially when it comes to green tea. And even then, you need to be cautious of the brand. A 2014 canadian study that tested green tea found that all of the tested teas contain pesticides. Lipton, Twinings, Tetley, and Uncle Lee’s green tea all tested positive for pesticides. According to foodbabe, Numi (my fav), Traditional Medicines and Rishi tea are some of the very few teas without pesticides, without GMO’s or chemical packaging. What type of matcha should you buy? The good news, is that a consumerlab.com report found that all the matcha it tested did not contain pesticides or heavy metals. But you are paying for this purity and richer antioxidant count. A single serving of matcha will cost you about a dollar vs .10 cents of a single serving of low grade green tea. Look for a Matcha tea that comes from Japan, and is a rich green color. Yellow coloring suggests lower quality matcha. It should not be bitter and almost have a slight sweet flavor. Like many other things, always stick to organic. We used Jade Leaf Organic, a certified organic farm in Japan which delivers approx 57-68 EGCG’s per serving. Higher than the average serving of EGCG’s of 50 to 55 per gram reported by consumerlab.com. For this mask, I chose to add in the clean crisp aroma of a drop or 2 of Lemongrass essential oil. Combined with the earthy smell of matcha, the lemongrass makes this mask smell so refreshing! There’s also a lot of reasons to add essentials oils to your face masks. Lemongrass is antiseptic and antibacterial which acts as a wonderful cleanser for your skin. Dr. Axe even recommends lemongrass as a natural toner. As a rule of thumb, never apply any essential oil direct or undiluted to your skin. This face mask recipe has a sweet almond oil that mixes with the lemongrass. The combination of Bentonite and Kaolin clay is one of my favorites. Mixing the 2 opposite types of clay creates a wonderful happy medium. Detox and acne fighting benefits of bentonite clay combined with the gentle cleansing and oil absorbing effects of kaolin clay. 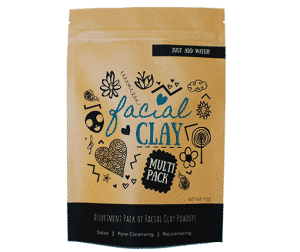 You can find both of the clays in our clay face mask assortment pack, that gives you enough to do 25+ face masks. Plus we have so many other recipes for you to try with all the clays. At two times a week, this will last you atleast 3 months. I put together 2 versions of this clay mask. One with all my favorite ingredients, one simple versions for the beginner DIY’ers. Option: Try this if you have sensitive skin or one of the lucky ones without acne. For a more soothing face mask, try this recipe with just 1.5 tsp Kaolin clay and honey instead of apple cider vinegar. PH level of this face mask (full version) is 6.47. I test the PH of all of the face mask recipes we create. Creating a recipe and not testing this number can be detrimental to you skin. A face mask that is too high in PH can disrupt the acid mantle of your skin. You need this barrier to be working it’s best to protect your skin from bacteria. A neutral PH is 7, while your skin PH can range from between 4.5 to 6.5. The PH level will vary depending on the ingredients that you use. This also varies by brand. I linked each of the brands that I used in my recipe to get that test. This recipe yields 1 face mask recipes. 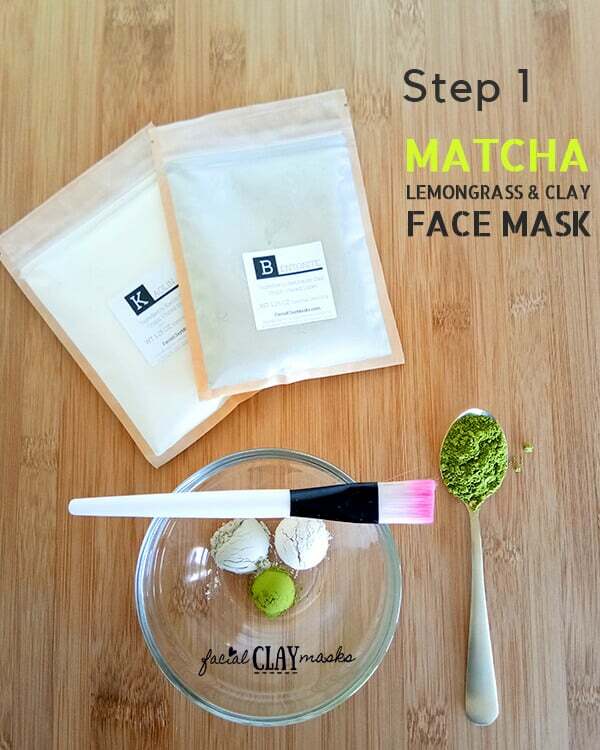 Step 1: Mix the dry ingredients, bentonite clay, kaolin clay and matcha green tea in a glass or plastic bowl. Step 2: Add in the wet ingredients, drop of vitamin E, 1 drop of lemongrass essential oil and 1.5 teaspoon of apple cider vinegar and mix together. While mixing the liquid together with the clay, it’s best to avoid using metal. Use a plastic, wooden spoon or spatula instead. 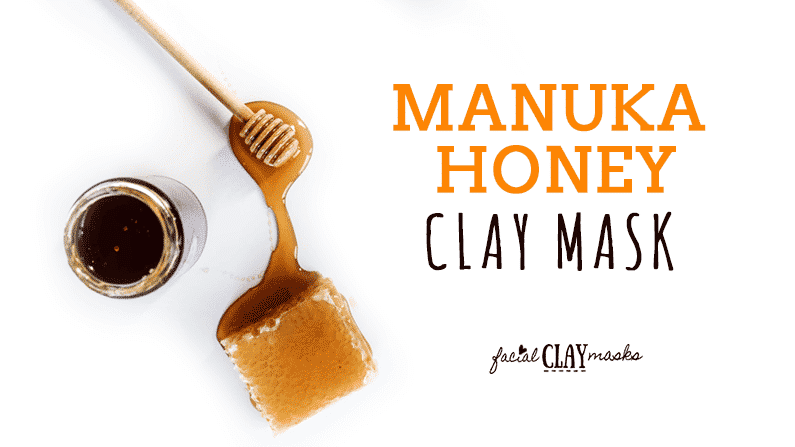 I created this handy how to use a dry clay mask guide. There’s one super important part to making a clay mask successful. Never let the clay mask fully dry. Apply to your skin using your fingers or a face mask brush, let sit for around 10 minutes. With a hot face towel, apply to face and remove clay mask. Always apply moisturizer after a mask. This has a PH of 6.5 so it’s a bit more alkaline on your skin, my slightly oily skin told me it needed some moisturizer afterwards. This mask and the matcha green tea latte are now in my weekly rotations after learning about the benefits. And how amazing my skin feels afterwards! P.S. while you are relaxing with a face mask. Relax with this matcha latte while you are enjoying your matcha face mask.